We have a pouch to fit your every need!!! Pouches, pillow packs, sample packs, packets, sachets, single-dose, unit-dose. . . . whatever you call it, we have a pouch to fit your every need. From less than one gram all the way up to six ounces, we can fill a variety of sizes and configurations. Custom tooling options are available, as are wipes and tandems. 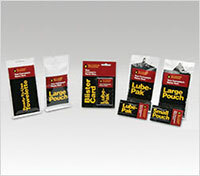 Graphics options include simple ink jet code, basic hot stamp print, and retail quality flexographic printing. We furnish pouches to a variety of markets including health and beauty, household consumer, industrial MRO and automotive. All of our machines have been fitted with custom filling systems which are capable of dispensing basic liquids and creams as well as highly viscous products.